The elephant appeared to be smoking in the video. New Delhi: Recently-released footage from the forests of Karnataka has left many scratching their heads. 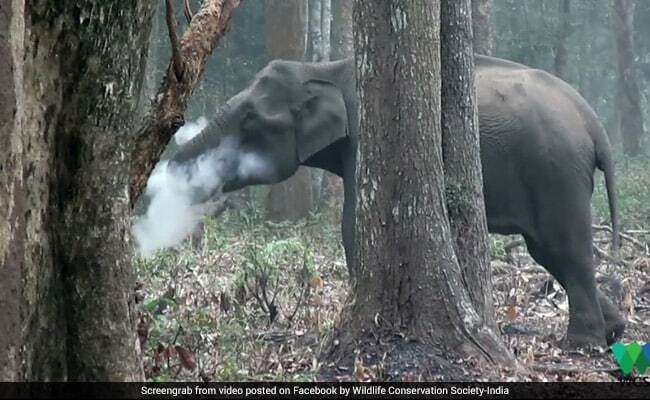 The video, posted on Facebook by the Wildlife Conservation Society-India on March 20, shows an elephant that appears to be smoking! Though the startling video was shot by Vinay Kumar, Assistant Director of Conservation Support and Policy at the Wildlife Conservation Society - India, in April 2016, it was shared with the public only three days ago. The astonishing video shows an elephant picking up something from the burnt forest floor and 'smoking' it. The incident took place in Karnataka's Nagarahole National Park. In a statement to NDTV, Mr Kumar said that the female elephant in the video was around 30 to 35-years-old. For those wondering what is actually going on in the video, Dr Varun Goswami, WCS India scientist and elephant biologist, explains: "The elephant was trying to ingest wood charcoal. She appeared to be picking up something from the burnt forest floor, blowing away the ash that came along with it in her trunk, and consuming the rest." According to Mr Goswami, charcoal may not have any nutritional value, but wild animals are often attracted to it for its "medicinal properties". It also serves as a laxative, which again attracts wild animals to it after 'forest fires, lightning strikes, or controlled burns of this type', he says in WCS's Facebook post. Though such behaviour has been reported before, Mr Kumar tells NDTV that this is, as far as he knows, the first time that there has been any visual documentation of it.